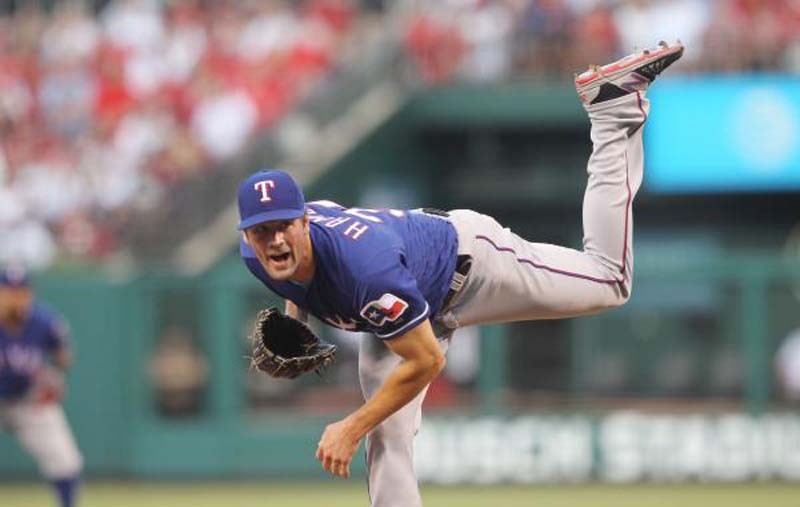 When surging Texas goes for a three-game sweep of the visiting Chicago White Sox on Sunday at Globe Life Park in Arlington, Texas, Cole Hamels, the pitcher the Rangers expected to be their bell cow in this season of rebuilding, will be on the mound. It remains to be seen how much longer Hamels (4-6, with a 3.61 ERA) stays in that position. He could, instead, be a huge piece to the puzzle in a trade that would net more prospects for a team in dire need of them. The White Sox will send right-hander Reynaldo Lopez (3-5, 3.73 ERA) to the mound in the series finale. The Rangers beat Chicago 13-4 on Saturday behind five solid innings from the ageless Bartolo Colon, a three-run double from Robinson Chirinos, a home run from Joey Gallo and a seven-run eighth inning. Texas was without designated hitter Shin-Soo Choo on Saturday as he battles right quad soreness and was given the night off. Choo said his upper quad has been bothering him over the past 10 days, but he's played through it well enough to extend his streak of reaching base to 41 straight games, tops in the Major Leagues this season. It's also tied with Toby Harrah (1985) for the third-longest single-season streak in club history. "I felt like it was an opportunity to get him off his legs, give him a day," manager Jeff Banister told mlb.com about Choo's absence from the starting lineup. "He's played through it for a while." Choo underwent an MRI at his own request on Saturday and said afterward he does not believe the injury is serious. "I know I have the streak going on, but my body and staying healthy is more important," Choo said. "And winning games is more important than records. I don't want to make it worse. I don't think it's serious." Chicago is another team building from the ground up but already has its second baseman of the future, Yoan Moncada, on the field as an everyday player. Moncada, who was acquired from Boston as part of the trade that sent Chris Sale to the Red Sox, has struggled through the first half of the season, hitting just .225 after batting .231 in 54 games last season. He also has a team-high 13 errors at second base. "I did not expect to have as many tough, difficult moments as I've been having," Moncada told the Chicago Sun-Times. "I've learned that this is a process, it's something young guys have to get used to. You can't get frustrated at any point. If you keep your faith in what you do, you're going to be good." Lopez will make his 17th start of the season, 10th on the road and second against the Rangers this season when he takes the hill on Sunday. He is 1-1 with a 2.55 ERA over his past three road starts. His last time out, on June 26, Lopez earned the win versus Minnesota, allowing four runs on six hits over 6 1/3 innings in an 8-4 Chi-Sox victory. Lopez is receiving a 3.45 run support average this season, the ninth-lowest in the AL. He will be making his third career start against the Rangers and second at Globe Life Park. Lopez garnered the win in his last start against Texas on May 20 in Chicago, pitching eight scoreless innings. Hamels will also make his 17th start of the season and leads all Texas starters in ERA (3.61), starts (16), innings (97 1/3), and strikeouts (97). He has gone 3-2 with a 3.28 ERA in his nine starts since May 5 to lower his ERA from 4.08 to 3.61. Hamels will be working on five days' rest and last worked and took a no-decision in the Rangers' 7-4 win on Monday at home against San Diego. He allowed a season-high nine hits in that game, exiting after trailing 4-1 in the sixth, ending a streak of eight straight starts six-plus or more innings pitched. Hamels has gone 2-0 with a 2.86 ERA in four career starts against the White Sox, recording quality starts in three of those four outings.